You’ve done it once more. Incredible writing! Yes, that was my intention, to write a response to the book, and yes I definitely agree that someone should read the book before making judgments or comments about it. There was one Amazon.com reviewer who outright said he hadn’t read the book, only what was available in the preview on Amazon and I commented on his review and told him it would be better to buy the book, read it, and write a real review, and he got very defensive. Having read I assume at least some of the review do you have any comments or criticisms? Wow! You had way more space for your review. Although yours seems more like a response than a review. I appreciate that you actually read Spiegel. I think we can both agree it rather irritating when people want to discuss a book they’ve never read. Thank you for taking the time to read Spiegel and for citing your sources. Meanwhile which “God” are you referring to? There is a book in my local library that contains over 2000 names of God from all times and places. And brief descriptions of each. Two thirds of the worlds population are not Christian. And thankfully many hundreds of millions of Christians (worldwide) would not subscribe to your narrow minded self-righteous religiosity—a religiosity that effectively damns everyone else who does not subscribe to it. We’re referring to the God of the Bible, the God of Christian theism. You’re right that two-thirds of the world isn’t Christian, but the fact that 2 billion people are might say something in its favor. But many of these believers (probably the majority) would agree with the content of the book, because the message is taken right out of the New Testament. The Bible says that God desires everyone to know the truth and be saved (1 Timothy 2:3-4). But we do have free will, so we have to choose. Many people, unfortunately, will choose to turn away from their Creator and go their own way. In that case, they choose their own destiny, and God respects their choice — although it leads to eternal separation from Him. But if anyone chooses to know Him, He welcomes them and adopts them into His family (Revelation 3:20; John 1:12). I’m sorry, but the claim that knowledge of God is innate is simply an absurd argument to levy against new atheists. Furthermore, it does not address the reality that there are other religions that do not believe in the same god that Speigel does. Are they psychologically dysfunctional as well? And why can’t a muslim say the exact same thing as Speigel about Allah? Or a Hindu about Krishna? This reads as poorly as Pascal’s wager and anyone who has taken a philosophy 101 course would be repulsed at such a broad claim. In addition to that, innate knowledge of God is a very unsubstantiated claim. Sure, you can quote Romans 1 and claim that it is evidence, but then a new atheist can quote from an atheist and say that we have those views as the result of evolutionary processes. It’s a stalemate argument at best, and since it is an argument from authority, it is a logical fallacy at worst. Furthermore, even if there is an “innate sensus divinitatis”, that doesn’t mean that the atheists are wrong in their claim that God doesn’t exist. Simply having a disposition doesn’t mean anything about the reality that we live in. Speigel must also prove that this sense is not simply a natural occurrence but actually gives us true divine information (something I wouldn’t think he proves unless he really is the greatest religious apologist in the history of mankind). So this is just an ad hominem against atheists and not atheism. All that this will do is attack the strawman that Speigel has conjured up about the new atheist that proclaims to be completely rational. I’ve never heard any new atheist claim this, and most deconversion stories are filled with an acknowledgment of the emotional aspect of their deconversion. And if there are new atheists that think this, then all that shows is that atheism isn’t a cure for being a self absorbed jerk. Finally, it does not prove that there cannot be a fully rational deconversion; that is, that you cannot reject god on purely rational grounds. I don’t see how a resurrected freudian psychology will give any sort of conclusive argument on this point as it is a modal claim about logical conceivability. Honestly, it’s books like this that make new atheists scoff at religious apologists because of the very premises the book is built on. It assumes truths of about christianity that they have reasons to dismiss and therefore anything that follows argumentatively will not be valid. And that last little claim, that atheists also make psychoanalytic attacks on theism, that doesn’t make it right to respond with an equally absurd and downright dumb reply to a segment of atheism that in my experience is definitely not the norm. This is only a book review. I read the book and then shared my thoughts about its contents. Since you seem to be responding to something you suspect is in the book, but isn’t, I’m guessing that you have not read the book. Spiegel isn’t arguing against atheism or for even for theism (let alone Christian theism); he is providing a possible Christian point of view for the origins of atheism. You’re welcome to read the book and then engage with the material and share your opinions on it, but until then you are just arguing against what you presume to be the contents of the book. You are also in luck, because Cloud of Witnesses <https://greatcloud.wordpress.com/2010/02/10/the-making-of-an-atheist-blog-tour/ > is collecting questions that you can direct to the author himself. One crucial step in Spiegel’s argument is the claim, based on Calvin’s theology and A. Plantinga’s development of it, that human beings are created with the disposition to believe in God (an innate sensus divinitatis). This also seems to reflect what Paul claims in Romans 1. Thus, the natural state of the human person is to believe that God exists, and to fail to form that belief requires an explanation. Spiegel finds two plausible explanations in moral character and behavior and psychological dysfunction. So, I agree with you that it would be an example of the genetic fallacy to just claim that atheism must be wrong because of moral and psychological reasons. But Spiegel begins with the claim that belief in God is the norm, and looks for an explanation to explain cases where the belief fails to obtain. I don’t see the connection between saying that one came to a belief because of psychological reasons as any sort of rationale for saying that the entire system of belief is irrational. If Kurt Godel was beaten by his logician father and out of pure spite he proved the incompleteness of arithmetic (did not happen like this), it would not make his proof less valid. Even if atheists have daddy issues or morality issues (which I doubt based upon my friendships with several atheists), and that motivated them to reject God, it doesn’t mean that the atheist position is irrational or unfounded; nor does it mean that their current beliefs and arguments are irrational. It simply highlights the bizarre world of our psychology and that we are not flawlessly rational creatures. Speigel needs to show that there is no rational reason to doubt the existence of god and therefore anyone who holds that position is only motivated by psychological trauma. Of course, this wholly ignores the reality that some people grow up atheists and never believe in God at any point in their life. If they came from a good home and don’t have morality issues, then Speigel can’t say anything about them and they truly could claim the rational high ground that his book is trying to prevent. 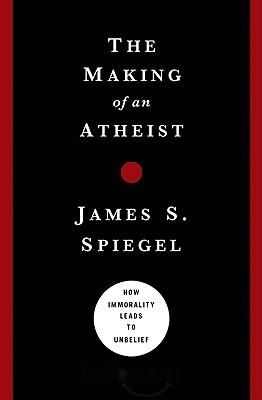 The context of Spiegel’s work is to deny that the New Atheists are as coolly rational as they present themselves. Since he lists ways in which Christians can learn from the questions that atheists raise, it doesn’t seem that he thinks atheists are wholly irrational. He wants to challenge that they are wholly rational; specifically, that atheistic argumentation follows unbelief rather than leads to it. when is any human action wholly rational? even actions/ideas that are wholly rational in themselves may be accompanied by human emotion. That does not lessen their rationality. Awesome. Will link to this soon. By the way, you guys need to keep an eye on Brian Auten on this topic. He’s written a great review of R.C. Sproul’s “If There’s a God, Why Are There Atheists?” and he’s reading the Vitz book to review it right now. I think the best confirmation that Spiegel’s thesis is correct is the desperate lengths atheists will go to to avoid things like the big bang, fine-tuning and origin of life, Cambrian explosion, etc.. They take refuge in unobservables. Unobservable hyper-universe, unobservable multiverse, unobservable aliens seeding the earth with life, unobservable precursor fossils, etc. It’s a Romans 1 world. Thanks, W. K.! If you don’t have the book yet, I can probably get you a review copy to review on your blog. You can email me at c.l.reese7@gmail.com and let me know. After reading the book, I was more convinced that, as you say, there’s a lot more going on than intellectual issues. I think we should answer the intellectual issues (and so does Spiegel), but it’s good to keep in mind that people aren’t just brains but also emotional and spiritual beings. A more straightforward reason why atheism often (usually? always?) involves willfully *rejecting* God, is that societies conspitre to incalculate the notion of God into children’s minds while they are too young to resist. It is necessary to willfully reject God for the same reason as it is necessary to willfully reject the concept of Santa: because both false concepts where placed in our credulous minds when we didn’t know better. If belief in God is so clearly and patently false, why would an avowed atheist (such as Antony Flew) change his mind? Was it a reversion to his Methodist upbringing? Of course, deism isn’t Methodism. In fact, they are not even particularly similar other than a belief in a God who creates. If this is your rationalization for Flew’s belief in God, then doesn’t this really beg the question? Why is it permissible to explain theistic beliefs in terms of moral-psychological factors (impressionable minds, etc. ), but not atheistic beliefs? Well, Adam, the concept of God clearly isn’t patently false – far from it: is beguiling. Especially if you are indoctrinated as a child. Obviously I have no idea why Flew changed his mind, but wasn’t it sad when he did? It’s always sad when a person loses his grip on himself and his identity in his old age. When a cleric in old age loses his faith, and loses himself that makes me equally sad. If you find Flew a cause for rejoicing then shame on you. Speigel’s point seems to be that belief in God is natural, because it comes first, and atheism later. My point is that belief only comes first because we ram it into our children’s minds. I don’t know that I have feelings about Flew’s change of mind. It sounds like you think he is getting senile. That would be sad if it is true. Ironically, your interpretation of Flew again cites a psycho/moral factor in (un)belief. Bringing us back to the main point that belief (in whatever system) involves psychological and/or moral factors–not just rational ones. However, I think you misconceive Spiegel’s position. The original, natural relationship of belief in God has been lost since The Fall. Now, each of us is born into a state of rebellion. It is this state of rebellion that prompts us to devise arguments against belief in God. He isn’t claiming that belief precedes unbelief; rather that psycho/moral factors precede intellectual justifications for unbelief.